Fungi is any group of eukaryotic, heterotrophic microorganisms, some members of which are capable of causing infections in humans, animals and plants. All of the fungi are Eukaryotic. They posses membrane bound cell organelles including nucleus, mitochondria, golgi apparatus, endoplasmic reticulum, vacuoles etc. They have glucans, mannons and chitin (polysachharides) in their cell wall and ergosterol in cell membrane. They are non motile because of having rigid cell wall. All of the fungi are chemoheterotrophs. They require organic compounds for both carbon and energy sources. They are osmiotrophic. They obtain their nutrition by absorption. 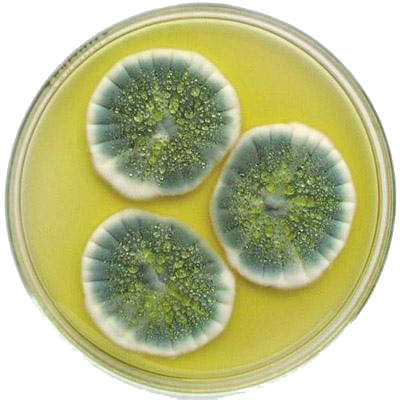 Fungi may be unicellular (yeast) or multicellular (moulds). All fungi are Gram Positive. Most are aerobic and facultative anaerobic. Very few fungi are anaerobic. Reproduction may be sexual or asexual. Many fungi reproduce both sexually and asexually. Food storage is generally in the form of lipids and glycogen.